Psoriasis is a skin disorder that happens mainly in adults and causes red or silver scaly patches on their skin. It often affects the scalp, elbows, knees and sometimes fingernails. But it can affect any part of your skin. Patches of psoriasis tend to come and go. Some people with psoriasis will develop joint problems called psoriatic arthritis. Psoriasis can't be cured, but it can be controlled. We don't know exactly what causes psoriasis but it often runs in families, so genetics may play a part in it. Also, your immune system is involved and causes inflammation of your skin. You can't catch psoriasis from other people. The scaly patches are caused by your skin growing more quickly than usual. Your body constantly makes new skin, which grows just under the skin surface. You constantly shed old skin from the surface but this is replaced by the new skin. Normally, it takes about four weeks for new skin to move up to the surface and be shed. 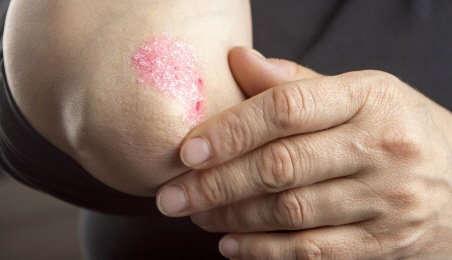 When you have psoriasis, you make new skin much more quickly, but you don't shed old skin more quickly. This means your skin keeps getting thicker as you add new layers to it. These thicker patches of skin also have more blood vessels in them, which makes them redder than unaffected skin. If you think you might have psoriasis, see your GP. Your doctor may be able to tell that you have psoriasis just by looking at your skin, but you may need to have a small sample of skin tested (a skin biopsy) to confirm this. This page answers questions such as: how common is psoriasis? Who gets it? What's the prognosis?